JACKSONVILLE, FL -- (MARKET WIRE) -- January 30, 2006 -- Smartphones Technologies has added a refreshing new category of mobile content -- college cheerleaders. This is the first time ever that this type of content is available for download to cell phones. Smartphones and Collegiate Images recently announced landmark agreements with many of the leading schools in college sports. Under these agreements Smartphones, secured exclusive mobile content rights including football, basketball, hockey, and every other sport available. College cheerleader mobile content adds an exciting new dimension to an already stimulating category and represents a new revenue opportunity for participating schools. "Cheerleaders, mascots and marching bands are a logical extension of our college sports content," said Mike Merrill, Founder and CEO of Smartphones Technologies. "Between the tech savvy college students and the incredibly loyal fans and alumni, we think college related mobile content will be a gold mine for both carriers and universities." In addition to photos of the cheerleaders as mobile wallpapers, Smartphones has exclusive voice ringtones, ringback tones and video ringtones featuring cheerleaders, mascots and marching bands. Smartphones is working with colleges and universities to videotape the cheerleaders performing the school cheers and the marching bands performing the school songs. For example, Florida State fans can have the "F-L-O-R-I-D-A S-T-A-T-E, Florida State! Florida State! Florida State!" or the marching band performing the FSU War Chant as voice ringtones and ringback tones. "Cheerleaders are a huge part of the excitement and pageantry of college sports," said Mark Geddis, President & CEO of Collegiate Images. "We're delighted to help Smartphones pioneer this new category of mobile content and introduce new revenue opportunities for schools." "Working with Smartphones and Collegiate Images has been an exceptional experience," said J. Stern, Assistant Athletic Director. "The University of Mississippi's sports images have been officially licensed and available for wireless downloads as wallpaper. We have experienced positive feedback regarding all the images, and we think the cheerleader content will be among the most popular." "I can't tell you how excited the K-State Athletic Department is that our cheerleaders are part of such an amazing opportunity," said Chad Kimmel from the Kansas State University. "They are thrilled to be representing the Wildcats in this new digital medium, and we are thrilled that we can provide this to all of K-State's loyal fans." Smartphones Technologies (www.smartphones.com) is a mobile content publisher specializing in custom celebrity and entertainment content. The Smartphones content library is currently available through thirty carriers and content providers worldwide. Smartphones works with motion picture studios, music companies, brand owners, and celebrities to create and distribute premium entertainment content. Smartphones is based in Jacksonville, FL and is privately held. 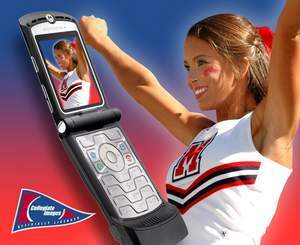 College Cheerleader mobile content is now <br> available exclusively from Smartphones.